TO REMOVE A LENS, turn the rangefinder dial to set the lens at infinity (oo). Hold the camera in the left band so that the body lens mount and the rangefinder dial are free to turn-during the uncoupling operation. 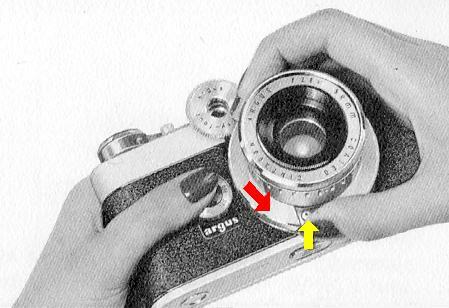 Hold the lens with the right hand (as shown) and push up on the lens-lock release (yellow arrow) as shown. Then give the lens a quarter-turn to the left (counterclockwise, in the direction of the red arrow) and lift the lens out.